Pinnacle Systems is introducing an innovative pocket-size device, Pinnacle Video Transfer, which records analog video onto any USB 2.0 storage device without using a PC. 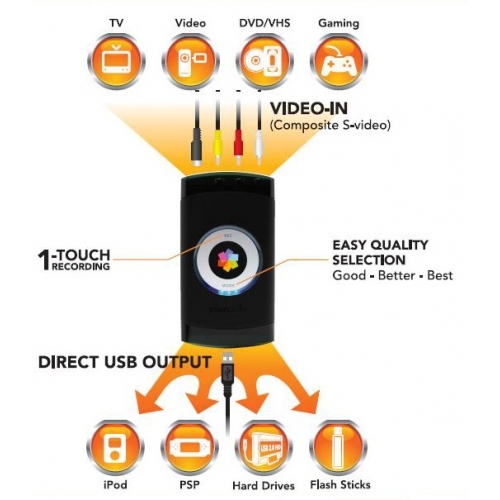 At the touch of a button, users with little or no technical expertise can immediately begin recording from a TV, DVD player, PVR, camcorder or set-top box directly to their Apple iPod Video, iPod nano (3rd generation), iPod classic Sony PSP, Sony PSP slim, USB flash drive or USB hard drive. is ideal for people who want to enjoy TV shows and personal videos on their iPod Video, PSP or just want to store them on a USB drive to archive or watch later. 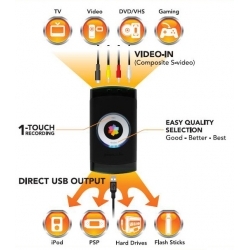 can be used by consumers with personal videos on VHS, Hi8 or VHS-C tape to make a digital copy on a USB 2.0 hard drive for safe keeping—without having to deal with complicated PC-based software. offers a very easy way for gamers to capture their preferred session in digital format that can be edited on a PC at later time.